After three winters of open water at a key crossing in Dawson, Yukon's government is seeking bids to help build a seasonal ice bridge. 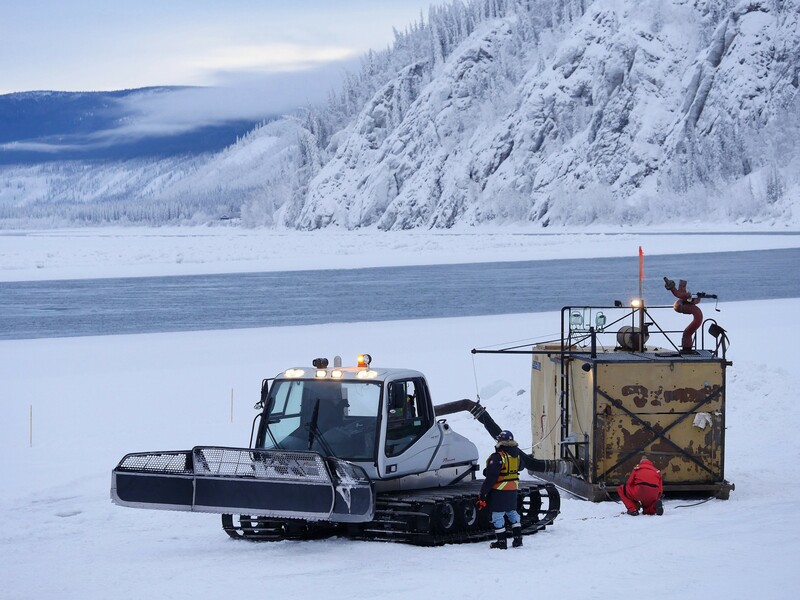 After three recent winters with open water on the Yukon River, government officials in Canada’s Yukon Territory want someone to design and build an artificial ice bridge to allow resumption of seasonal travel at an important site there. The Yukon government is advertising for bids from potential ice bridge builders who would bring back a winter river-crossing route used for decades by residents of the Gold Rush town of Dawson. A 400-meter ice bridge has been used there regularly since the 1960s, but the window for its availability has narrowed considerably. While there is much year-to-year variability, the period when the ice can be crossed declined at a rate of 1.75 days per year from 1995 to 2016, according to a study by the National Research Council of Canada. In the past two years, open water persisted through the winter and there was no ice crossing at the traditional spot. Climate change is the obvious suspect in the demise of river ice at Dawson, according to several studies, including from the National Research Council of Canada, which was asked by the Yukon government specifically to examine the bridge problems. More than just temperature is at play, according to studies. The volume of water and water levels have also changed, as has the load of sediment and the condition of soil as permafrost thaws. Effluent from a wastewater treatment plant is also a possible factor, according to the latest study. The ice bridge is important for many Yukoners. Most Dawson residents live on the east side of the river, but there are about 150 to 200 who live on the west side, and travel between that area and the main part of Dawson requires a river crossing. In the summer, there is ferry service. In winter, there has been solid ice, strong enough to accommodate vehicles and industrial equipment — until recently. In the past two winters, and in the winter of 2013-14, open water that persisted through the entire season precluded the construction of an ice bridge. Last year, the territory tried to create a bridge by spraying water in the same manner that would be used to create an ice road on the tundra. The C$120,000 project was not a success. However, some residents set up their own somewhat tenuous bridge using a fallen tree and some rope. For this winter and those to come, several ideas for a man-made Yukon River winter bridge are being considered. The National Research Council study offers a variety of options, including a series of floating booms that would help collect ice and would serve as a bridge platform themselves. “The Dawson City ice bridge has historically been a relatively successful operation. But these new circumstances – i.e. the existence of an open water lead – call for new or novel procedures and techniques. The conventional bridge building methods may no longer be sufficient,” the study said. The hope is to attract a qualified party, with ice bridge experience, and to have construction start in December, said Brian Crist, manager of highways and airports design and construction for the Yukon government. Exactly what kind of bridge would be built is yet to be seen, Crist said. And the start date will depend on the weather, he said. “It doesn’t matter if you’ve got spray equipment or booms or whatever. If it’s not down to minus-20 degrees (Celsius) or colder, you can’t build an ice bridge,” he said. Beyond this winter, Yukoners might need some long-term fixes to the river-crossing problem, Crist said. If a warming climate continues to cause problems, “we’re just going to have to roll with it,” he said. The ice bridge challenges are part of some sweeping changes documented along the Yukon River, which runs nearly 2,000 miles and is one of the far north’s major waterways. Records collected over more than a century show big changes in freeze and thaw timing, with much longer periods of open water. Freeze-up of the Yukon River at Whitehorse, the territory’s largest city, became steadily later over the 20th century; the date advanced by 30 days from 1902 to 1993, according to a 2010 study by the late Rick Janowicz, a longtime Yukon hydrologist. During the era of Klondike Gold Rush, the historical event for which Dawson is famous, river freeze-up was well underway by September. In 1897, gold-seekers who hoped to travel by boat from the river’s Bering Sea mouth to the heart of the Klondike mining district 1,700 miles away were out of luck if they left Seattle later than Aug. 1, according to Yukon historian Pierre Berton. Of the 1,800 stampeders who attempted the “rich man’s route” in 1897, only 43 reached the Klondike before winter, Berton wrote.